The Bowman name evokes dreams of rookies and prospects among collectors. While it might not have quite the same history in football as it does in baseball, 2012 Bowman Sterling is looking to help change that. Loaded with autographs, memorabilia cards and Refractors, nearly everything in the set is centered on the crop of 2012 rookies. 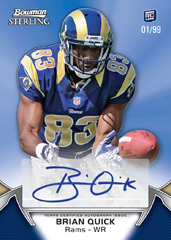 The 2012 Bowman Sterling Football base set checklist has 100 cards. Anybody with NFL experience prior to 2012 is excluded. The base set consists entirely of rookies. Printing Plates and five levels of Refractors make up the parallel chase. All Refractors are numbered with Blue being the most plentiful at 99 copies. Base cards fall three per pack. Every 2012 Bowman Sterling Football pack also has a Rookie Autograph that is a base set parallel. The checklist has 60 signers. Every autograph is numbered. Rookie Autograph parallel include: Blue Refractor (#/99), Black Refractor (#/50), Gold Refractor (#/25), Prism Refractor (#/15), Printing Plates and SuperFractor (1/1). Every box also comes with a Rookie Autograph Relic and a Rookie Autograph Patch Relic. Both have player-worn memorabilia. Refractor parallels all use patch swatches. Dual and Triple Autographs include both rookies and veterans. Numbered to no more than 25 copies, each also has a Patch Relic parallel that comes with swatches from each of the featured players. The format carries over to Quad Autograph and Six Autographed cards. Built as book cards, they come with Patch Relic parallels as well.Jumbo Relics are inserted one per pack with each 2012 Bowman Sterling Football box promising one Jumbo Patch card. Fifteen veterans have a similar Refractor structure: Blue (#/75), Black (#/50), Gold (#/25), Prism (#/15), Printing Plates and SuperFractor (1/1). Those numbered to 25 or less have patch pieces.More plentiful are the Rookie Jumbo Relics. With 40 subjects, the checklist is much bigger. Add to that, higher Refractor quantities: Blue (#/99), Black (#/75), Gold (#/60), Prism (#/35), Printing Plates and SuperFractor (1/1). All of the Rookie Jumbo Relic parallels are patches except for the Blue Refractors. Prism Refractor Dual Autographed Dual Relic Cards are a case hit. Each numbered card has two rookie signatures and two jersey pieces. Jumbo Rookie Patch Box Toppers add some extra value for box breakers. All of the 35 cards in the set are numbered and have five Refractor parallels plus printing plates. 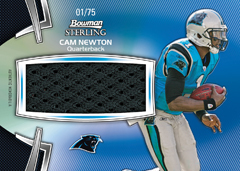 2012 Bowman Sterling Football also has ten one-of-one Sterling Cards that are made of sterling silver. Sticking with the theme of the set, all Sterling Cards highlight 2012 rookies. Up to 50 random boxes will also have over-sized Multiple Rookie Autograph Patch Box Loaders. Each of the five cards in the set come with four autographs and four patch pieces. The cards measure 4" x 5.5" and are numbered to 10. Good: Number of hits per box. Better box guarantees. Bigger relic swatches with more patch hits. Greater focus on top rookies. Improved overall look and card design. Bad: High number of undrafted players. High box price. No veteran base cards. Some cards show glue residue on the foil board finish. Sticker autographs. The Bottom Line: Love it or hate it, Bowman Sterling is back with a huge crop of rookies to fan the collective flames of hobbyists. This year's release is backed by the names of Luck, Griffin III, Richardson, Wilson, and Foles. Collectors looking for rookie cards are in for a treat as the product has been revamped to include all rookie cards including base cards. The only veteran presence is a smattering of memorabilia cards. The base cards are produced on premium card stock and have a very sharp chrome finish. The in-action portraits really stand out. Cards are very bright and make for an outstanding design. One change this year's product is the thickness of card stock for the hits. They feature 180-point stock. The base autographs are, unfortunately, stickers. This is a shame for such a high-end product. The relics cards have also received an upgrade with the inclusion of jumbo swatch relics and more patches. The base relics contain rectangular swatches, which matches with the player's uniform shown on the card. The autographed relics contain a small square relic with a sticker autograph. Each pack has five cards each with three base cards and two hits. 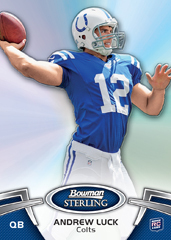 The entire 2012 Bowman Sterling Football base set consists of rookies.. Nothing against David DeCastro, Robert Turbin, and Marvin McNutt but, geez, I would have liked a little veteran variety thrown in. The topper pack this year features a rookie jumbo relic card from one of the 2012 rookies. Many of these over-sized cards feature multi-colored patch swatches. There are parallel colored Refractor versions with varied numbering, but the base patch cards are usually numbered to 99. First things first, this product is not for the average collector. Packs are generally going to run around $50 and close to $300 for boxes. Topps decided to do away with the mini box style packaging and went with regular foil packs this year. 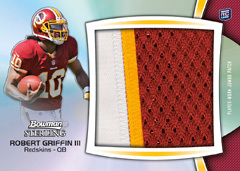 Topps delivers another high-end football release that has many great aspects like patch variation box toppers. There are some huge and colorful patches to be found before you even get into ripping your packs. The cost is high so this probably isn't one for those on a tight budget or a set builder. But the thrill-seeking box breaker might want to rip several. Awsome looking, great catagories, always great product. Im strongly always each yr impressed with the sheer contrast of the coloring and the different autos in this product , each card whether autograph, paralell or numbered cards or even rookie cards always meet my expectaitions , I like the on card options rather than the sticker signatures on the cards , for the simple fact ive had the stickers wear more than the ink , But all in all Bowman steps up to my highest expectations , used to be all topps kinda fan but scince buying bowmans product I am sticking with this product , your staff and dept really come through and i give major props for the dedication in doing something , not only enjoy and like as far as making the product but others appreciate your hard work !! !